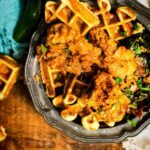 Hands down, the best fried chicken and waffles recipe out there. A mix of heat and sticky-sweet maple syrup coats this buttermilk fried chicken as it sits over savory cornbread waffles. Whisk the flour, cornmeal, baking powder, salt, and cayenne together in a large bowl. Toss the jalapeno, scallions, and cheddar in to mix. Whisk the butter, eggs, buttermilk and maple syrup in another bowl to combine. Pour into the flour mixture and toss until everything is just moistened. Working in batches, scoop batter into your preheated waffle iron and cook until golden brown. Set cooked waffles in a preheated oven to keep warm while you finish prepping the rest of the batch. Waffles can be made ahead of time, and frozen for later use. In a heavy duty resealable bag or container, mix enough buttermilk to cover the chicken and maple syrup to combine. Add the chicken thighs and allow to sit overnight. When ready to cook, pour cooking oil into a large heavy-duty pot (preferably cast iron) to about 4 inches deep, leaving at least 1 inch from the top of the surface of the oil to the rim of the pot. Set up your workstation. Whisk the flour, cayenne, and pinch of salt together in a large bowl, divide into two bowls. Whisk the eggs, buttermilk, and maple syrup in another large bowl. Working in batches, arrange the chicken in the buttermilk next to the first bowl of flour, dip and cover in flour. Shake off any excess flour. Dip the chicken into the egg bath and coat, draining off excess egg. Then toss in a bowl filled with the remaining flour mixture for that perfect outer coating. Using a cook safe thermometer, monitor the temperature of the oil, and adjust your heat level as needed. Without shaking off any extra flour, using tongs, transfer the chicken carefully to the pot of hot oil and allow to cook. Too hot or too low can produce soggy, oil-drenched undercooked chicken and no one wants that. Carefully remove the chicken with a slotted spoon and drain on a wire rack over a baking rack lined with paper towels. Repeat as needed. Check the internal temperature of the chicken and make sure it is 165 before serving. Otherwise, finish the cook by tossing the chicken in an oven preheated to 350 degrees for another 10 minutes. Pro Trick: Preheat the oven to 200 degrees to keep everything warm for serving while you work your way through the frying and waffle making process.